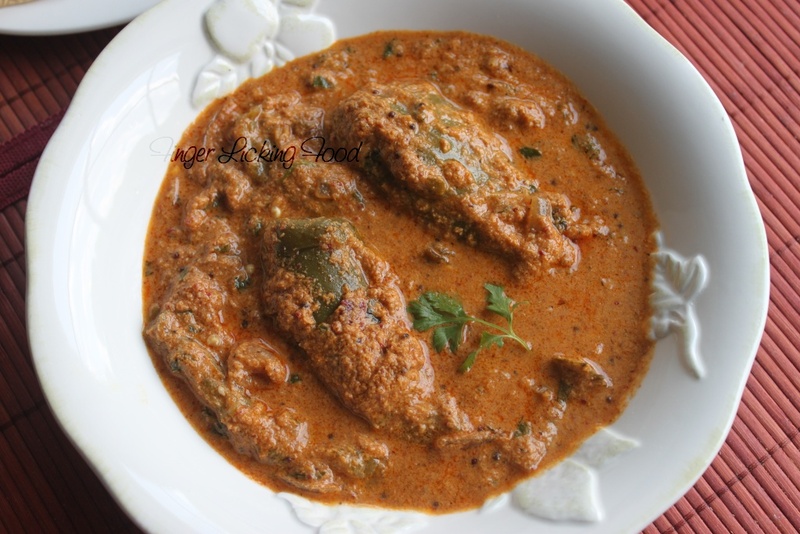 Mirchi ka Salan is a typical dish from Hyderabad traditionally served to be eaten with Biryani. 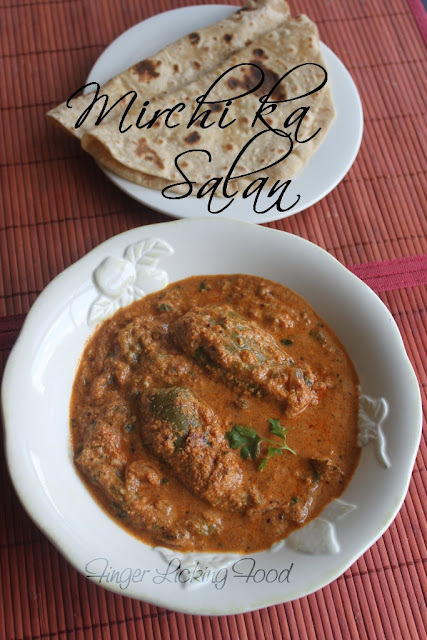 Mirchi translates to Chilli in Hindi and Salan is a gravy so it’s a spicy tangy gravy with chillies in it. This dish can be made with any kind of chilli – hot chillies like the Thai Chilli pepper or Serranos as well as the slightly milder one like the Jalapeno. 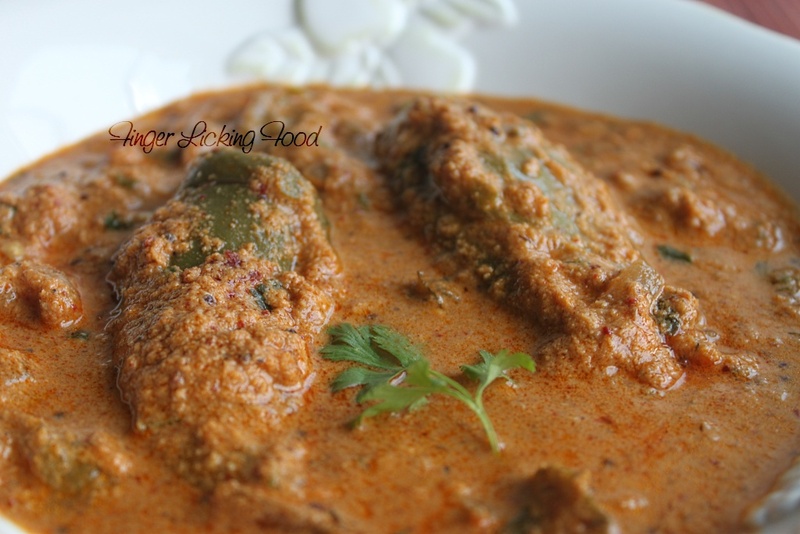 I prefer to use Jalapenos, so that I can make the gravy very spicy and also the Jalapenos hold up well when pressure cooked. Roast each of the ingredients separately until fragrant and slightly brown. Pulverize in a blender to a fine powder. Note: You can vary the number of dried red chillies to suit your preference for spicy levels. Slit the jalapenos in half up to the stem taking care not to cut it completely. Fill each jalapeno with little of the ground powder. Make a paste with the remaining powder and ‘to grind’ ingredients. Heat oil in a pressure cooker. Add the mustard seeds and when it begins to splutter add the curry leaves. Add the sliced onions and sauté until done. Add the prepared paste and sauté for a few minutes. Now add the filled jalapenos, ½ cup water enough to submerge the jalapenos. Season with salt, stir and then close cooker with lid. Turn heat to high, when the steam begins to rise, place weight on lid turn heat to low and cook for 8 minutes. Turn off heat, let cooker cool well before removing lid. Stir and serve hot with rotis. Wow what colours! I absolutely love this one.